Wow, this stone is amazing. Very powerful... the minute I held it in my hand I could already feel it assisting me. Very very high vibes! I’ve been wearing it everyday and have programmed it to help assist me in a more specific way. I’ve already developed a very strong relationship with this stone and am really looking forward to building upon our connection. So happy with this purchase, I definitely have my eyes on a few other pieces. I’d highly recommend a Quantum Stone to anyone who loves working with crystals. Upon receiving stone had hair line crack. Order said it would come with stainless steel rope chain, it did not. Overall stone is nice,can feel energy within it. When i first opened the packaging, i could feel the energy of my labrodite. It was a very nice feeling, and everytime i put on my necklace i can feel the flow in my body. This necklace is, by far, my favorite piece. I wear it everyday and only take it off to shower. Shipping was very quick and the packaging was top notch. Looks Great & Works Fast! First I have to give thanks to Albert again for getting my second piece out to me so quickly and again the nicely included hand written note of gratitude! This is a nice looking pendant and when the light hits it especially the sun you see all these brilliant hues of blue tint which really has to be seen. One of the properties of this amulet is that it works fast and it helps you find lost items. I can attest to this! My original birth certificate and my multi-lock registration card which I misplaced/ lost about 15 years ago I suddenly found this past week and it was literally right in front of my face the whole time! Also when you wear this pendant you feel the energy immediately and strongly! 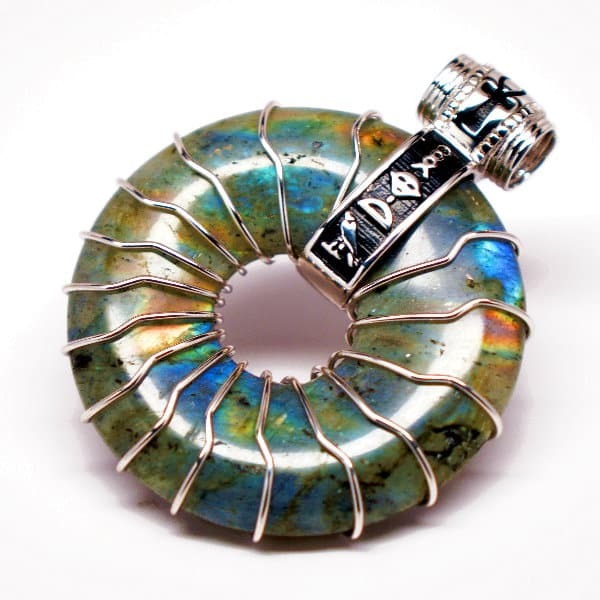 Those of you who may not feel anything when wearing one of your chosen amulets probably do not need what a particular pendant is offering that's why you're not feeling, seeing or getting the changes you need, but if you do need Labradorite in your life it works quickly. Last but not least to anyone purchasing and reviewing after reading mine or any of the other testimonials to talk about any changes in your life if any and be a little more descriptive! Thanks my People/ QuantumStones/ Albert! My wife felt very happy and we shared it every other days so that both of us can bond .